Online discussions of any legal, political or ethical topic will frequently lead to bitterness and hostility. Those who are motivated to take part in such discussions are usually the ones who have a strong, probably entrenched, view on the subject, and so whenever they come across others who see it differently, the chief by-products of the – probably lengthy – exchanges will be personal vitriol, and cognitive dissonance. Discussions of the Hillsborough Disaster are no exception to this. Unsurprisingly, it is a subject that causes passions to run high. Over the years I have had disagreements with people on both sides of this subject; usually with those who are convinced that the Liverpool fans were to blame for the Disaster, much more rarely I have had disagreements on narrower details with people who blame the South Yorkshire Police. Now I dislike the practise of categorising people, but I have noticed large numbers of people fitting into a relative handful of patterns, and I’ve decided it would be interesting to see how many of these Categories others will recognise, or might like to watch out for in the event they ever get into such debates. It goes without saying, incidentally, that there is often considerable overlap between these Categories. Category 1: The ‘I-hate-Scousers-Therefore-The-Fans-Are-Guilty’ type. Others include people from South Yorkshire and Sheffield itself, where the Hillsborough Disaster happened. Their motivations seem chiefly to be geographical loyalty, a sort of cross between a blind love of their home and an uneasy desire not to recognise the possibility that they are policed by dishonest people. Dishonest policemen, that is to say, who, when they make a calamitous mistake, might be willing to smear anyone – locals included – to protect their own reputations. Others in Category 1 may include people from the south of England, especially London, who just view the north from far enough away that they only see people there as stereotypes. Whichever sub-group people in this category belong to, what is noticeable about all of them is that they have almost no knowledge of anything that happened on the day at Hillsborough, beyond the very broad basic understanding that there was overcrowding, and that it happened during an era when football hooliganism was rife. They usually put these two details together without first checking whether there is any reason to, draw the only conclusion that such a combination can lead to, and then make no attempt to carry their thoughts beyond that. Category 2: The ‘Okay-So-The-Police-Cocked-Up-But-The-Disaster-Still-Wouldn’t-Have-Happened-If-The-Fans-Had-Behaved’ type. Marginally less ignorant, but no less irritating, than Category 1 are a type who are just informed enough to realise that there were serious failings in the police operation at Hillsborough, and even that the police subsequently took steps to cover up the failings. However, Category 2’s are apparently not intelligent enough to realise what implications that cover-up must have for the notion of fan misbehaviour – a notion that was put about by the police to begin with. Category 2’s have for many years had a stuffy air of surly impatience about them. Their usual turn-of-phrase on the subject of Hillsborough has gone somewhere on the lines of, “Well, yeah, the police made a mistake, but really, it’s time the Liverpool fans got over this. I mean, it’s been so long, and it wasn’t all the police’s fault anyway, was it? If the fans hadn’t spent so long drinking in pubs, and got into the ground in good time instead of at the last minute, the police would never have had to open the gate…” and so on. These people think they are making an informed and balanced judgement. What they don’t realise is that they are in fact quoting the very same crocks that the police themselves had put about in order to draw attention away from – or at least to mitigate – the fact that they had fouled up so monumentally to begin with. Somehow, Category 2’s just can’t put two and two together and realise that if the South Yorkshire Police were covering up important facts about what caused the Disaster, any claim they make on the subject needs to be treated with real skepticism. Category 3: The ‘Liverpool-Fans-Rioted-At-Heysel-Therefore-They-Were-To-Blame-For-Hillsborough’ type. This sort of springboard logic I find is, for some reason, very prevalent in the comments sections on YouTube videos about Hillsborough. Often it is a retreat point for people in Categories 1 and 2 when they find their more typical arguments – such as they are – are not cutting the proverbial mustard. However, I have also found enough numbers online of a specific type to justify putting them in their own category; they are a type for whom invoking Heysel appears to be not just their retreat point, but in fact their only argument. They seem to think that because of the horrors of Heysel, that is all the evidence you need to blame the Liverpool supporters for Hillsborough. The main problem, of course, is that Heysel and Hillsborough are two separate events pretty much entirely. They happened in different years. They didn’t even occur in the same country. The Heysel Tragedy occurred at the European Cup Final in Brussels (that’s in Belgium, for the Internationally-illiterate) in 1985. The Hillsborough Disaster happened in Sheffield in 1989. Therefore, claiming that the riot at Heysel could even begin to prove that Liverpool fans misbehaved at Hillsborough is utterly demented, when those who misbehaved at the former weren’t even present at the latter. It seems many Category 3’s genuinely believe that when someone riots while wearing a club shirt, it will make everyone wearing the same colours equally guilty, as though football kits form some kind of supernatural link that goes beyond even a genetic level. As I say, this perception is utterly demented. Category 3’s in fact have an equally demented, rather paranoid view of Heysel and Hillsborough side-by-side. Some are convinced that there is a shady, behind-the-scenes conspiracy between the Government and the BBC to make sure that Heysel is kept from public recognition, and that those who were to blame for the riot are being protected from facing justice. They feel that reference to Hillsborough is used as a method of concealing the reality that Heysel ever happened. This is of course just mindless ignorance. In the real world, Liverpool fans were excessively castigated for years after Heysel, especially by the Government, which being run by Margaret Thatcher, viewed socialist Merseyside as a fifth column and arch-enemy. And for all the paranoid cries of “Justice for the 39!” by the Category 3’s as a retort to the Hillsborough motto of “Justice for the 96”, the truth is that, as I said above, the main rioters were all tried and convicted well over twenty years ago. Officials in the Belgian FA and the Belgian Police force were convicted as well. (European football’s governing body, UEFA, who also bore major responsibility for selecting an unfit stadium to host the game, have persistently dodged their share of the blame, and so any cries of “Justice for the 39!” should more properly be directed at them instead of at Liverpool.) By contrast, no one has ever been convicted for the even greater Disaster at Hillsborough. That, everybody, is why discussion of Hillsborough carries on, where discussion of other footballing tragedies has quietened down. It is not a double-standard at all; those who were at fault for Hillsborough have never been held to account, in contrast to most of those who were to blame for Heysel. Category 4: The ‘I-Wish-To-Judge-Impartially-And-Impartiality-Means-Knowing-Nothing’ type, AKA The Hillsborough Solipsist. This category is mildly infuriating rather than actually irritating, as the position they take will do no real harm. But they are also probably the weirdest category, because their position is so ‘uncompromisingly neutral’ – if that’s not a contradiction in terms – and contributes so little to the discussion that one is given to wonder why they bother commenting on Hillsborough in the first place. Now, this wittering stance is not exactly wrong, but it is a little silly. To say you can’t know for sure things that happened when you weren’t there is frankly lazy, as it excuses you from bothering to interpret the evidence that an event will leave behind. There is enormous evidence, almost beyond imagining, to give us an accurate idea of what happened at Hillsborough, between hundreds of eye-witness accounts, over seventy hours of CCTV and video footage, and thousands of photographs. It would be fair to say that we will never be able to tell the complete story of what happened at Hillsborough, for there were well over fifty thousand people in the stadium that day, and every single one of them will have a story that includes information unique to themselves. But we have long had far more than enough to establish beyond any sensible doubt that the cause of the Disaster was a failure of crowd management by the police. As far as I can see, the only reason ‘Hillsborough Solipsists’ express doubts about it is because they just can’t be bothered to look up the answers, even though the answers are well-documented and easy to find. Category 4’s try to dress this laziness up as impartiality, but they only manage to do this by confusing impartiality with ignorance. Category 5: The ‘It-Was-The-Government-Who-Was-Behind-The-Cover-Up-And-Nothing-You-Can-Say-Will-Convince-Me-Otherwise’ type. I suspect I’ll get a few nasty remarks for this one – alas, they will be far from the first – but I have to mention that the flipside of the argument has a fanatical wing of its own that routinely says things as vile and fallacious as the SYP-apologists. For the most part, I wholeheartedly agree, and always have done, with this Category’s overall position i.e. that the Liverpool supporters were more or less blameless for Hillsborough, the chief responsibility for the Disaster lies firmly with the South Yorkshire Police, and that there was a subsequent cover-up of the Disaster’s causes by the British legal industry and emergency services. Where I differ from Category 5’s though is how far the cover-up extended to. Or to put that in a more Hollywood way, who else was ‘in on’ the conspiracy. Quite simply, (yes, I’m sorry, but I have to say it and I will) there is no evidence whatever that the central Government of the time, or any Government subsequently, actively participated in the cover-up. They seemed to turn a blind eye to the warning signs that something dirty was going on in South Yorkshire, sure, but there is nothing to suggest that there was any active help from Downing Street or Whitehall. Much as we would enjoy seeing Margaret Thatcher, Britain’s second-most militant right wing Prime Minister (behind the brutal Winston Churchill), implicated in Hillsborough, the sad reality is that, even with the release of the Report of the Hillsborough Independent Panel, no evidence has ever been found that even hints at the Government assisting the South Yorkshire Police with the cover-up. Not one shred. Some such evidence might emerge in the months and years ahead as the putative ‘hidden documents’ that were never released to the Panel for various murky reasons are finally exposed to the public, but at the moment, that’s just a guess. The problem for me with Category 5’s is that if you point this out to them, no matter how calmly, steadily, gently, or even meekly, you can guarantee that they will go absolutely ballistic at you. They will swear at you, they will rage at you, they will growl at you and they will insult you. Many of them will even start looking for reasons to accuse you of blaming the fans for the Disaster, which, at least in my case, would be beyond ridiculous. If you keep your cool in the face of all that and ask them to present some evidence against Thatcher’s Government, all they will ever be able to invoke is the mythical ‘Thatcher quote’ (the viral rumour that at some point in 1989 or 1990, Thatcher announced her intention that “No police officer will ever be convicted for Hillsborough”), which they will in turn not be able to offer you any clear source for, and will get more angry with you than ever for daring to ask them for one. Nor do they tolerate any suggestion that the quote, even if it is genuine, is not particularly strong evidence that she did anything to interfere in the process. Indeed, another infuriating aspect of Category 5’s is just how vague their accusations against Thatcher are as a whole. They are unshakeably convinced that she assisted in the cover-up, but can never offer any coherent explanation of what her role in it was, or even why her assistance in it would have been particularly necessary to make it work. If she assisted the South Yorkshire Police in the cover-up, why in thousands of documents from the police files is there not the slightest hint of any such assistance being received, even though those same documents are at times shamelessly explicit about the police’s own shenanigans? Again, ask that question of a Category 5 and it will just make them even angrier. 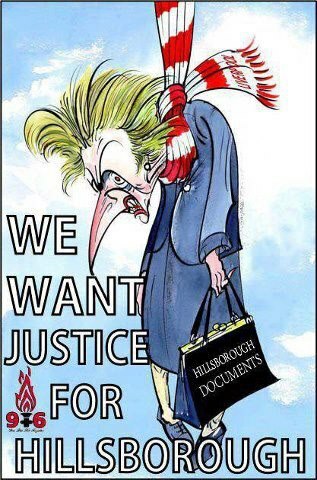 I’ve encountered several really stupid Category 5’s who go even further by actually arguing that the Hillsborough Independent Panel themselves have covered up the evidence against Thatcher. Just one of the many problems with that conspiracy theory is of course that it rejects the veracity and reliability of the Panel; thus the vindication of the Liverpool fans and condemnation of the South Yorkshire Police that are presented by the Report themselves would immediately have to be dismissed as unsafe, which is surely the last thing the Category 5’s would want. The stubbornness of this anti-Thatcher position leads to a horrible hypocrisy. Category 5’s are intolerant of suggestions that there is no reliable evidence against Thatcher, because they ‘just know’ that she is guilty. But for well over twenty years, uninformed people around the country accused Liverpool fans of being to blame for the Hillsborough Disaster, and when challenged to prove it, they would say that they “just knew”. Or even that “everybody” just knew, just as, once upon a time “everybody knew” that the sun orbits around the Earth. For Category 5’s, it seems bandwagon fallacies of this type are only wrong when they are on the receiving end of them, not when they are brandishing them. Worse yet is the almost visceral aggression in this Category. Whereas most campaigners for Hillsborough Justice do in fact want justice itself, I’m afraid Category 5’s do not. They want blood. They want revenge. They want to see Thatcher physically tortured and summarily lynched. Much as I loathe Thatcher and her heartless right wing politics, I do not see anything to admire or anything appealing in the outcries for her to experience brutal physical suffering. She may not deserve any better, but it would achieve nothing except to martyr her, and the act would be horrifying to behold. It would drag British socialism, and the cause for Hillsborough justice, down to the level of the South Yorkshire Police, and the draconian suppression of dissent that occurred throughout the north of England during the 1980’s. I do not see how justice for those crimes can ever be achieved by repeating them. If she really was involved in the cover-up, I would want to see Thatcher in the dock for it (assuming she isn’t too ga-ga to be tried). I would not want to see corporal-and-capital punishment deployed as well. Ultimately, those who see Thatcher as being involved in the cover-up mainly do so out of a desire to make her suffer for her dreadful mistreatment of Merseyside throughout her time in office. While that resentment is perfectly justified, it is a political matter, and not really relevant to Hillsborough itself. The Disaster should not be exploited for political reasons, not by people on either ‘side’ of the argument. Whatever we think about Thatcher (and who doesn’t?) do we really want the battle for justice to be reduced to a rabid hate-campaign of this type? EDIT 8/4/2013: The news this morning has come through that Thatcher has died of a stroke, so this revenge issue I suppose becomes a little moot. Category 6: The ‘Oh-It’s-Terrible-What-You’ve-Been-Put-Through-Yes-You’re-Completely-Innocent-Yes-The-Police-Were-Definitely-To-Blame-Right-Now-We’ve-Cleared-All-That-Up-It’s-Time-To-Move-On’ type. I don’t have any major issue with the Category 6’s, and their position in fact is not that remote from my own. There are times when I do seriously question what imprisoning the officers of the 1989 South Yorkshire Police, at least for the Disaster itself, would achieve. But at the same time, I do think the Category 6’s are hopelessly unrealistic, and also that they are confusing slightly different issues. Firstly, I agree that it has been a long time since the Disaster, but where do we draw the line? Are we saying that there’s a formal ‘finishing line’? A length of time, that, once it has passed, we can cheerfully announce that the police have officially ‘got away with it’, no matter what evidence is uncovered subsequently? What exactly should such a timeframe be, and why that timeframe in particular? Secondly, and more seriously, many outside commentators on Hillsborough seem to confuse the Disaster itself with the cover-up that followed, when they are actually two related but separate cases of police misconduct. The Disaster could probably be let go of and moved on from with only modest account being given. There would have to be at least a few convictions for that, as a mark of respect to those who died, and a mark of acknowledgement of the debt that the police owe to society, but probably not huge sentences or great numbers of them. But the thumping insensitivity with which the South Yorkshire Police treated grieving relatives in the aftermath of the Disaster, and the unashamed dishonesty with which they tried to smear the victims and to protect their own backs, are a very different matter. There is no way whatever that the post-Hillsborough cover-up can be treated anything like so leniently. The South Yorkshire Police’s behaviour, not just in relation to Hillsborough, but throughout the 1980’s in general, was nothing short of Stalinist. Throughout the Miners’ Strikes, and in the aftermath of Hillsborough, they routinely acted like they were not subject to the very laws they were supposed to be there to enforce, and no police force in any country can ever be allowed to behave in such a corrupt fashion. A police force that behaves in such ways without being called to account for it is likely to repeat its crimes, probably with increasing brazenness, and as the police themselves are supposedly all we have to protect the public, this would raise a very frightening dilemma; who can protect the public from a corrupt police force? More even than police negligence or police incompetence, police corruption must always be guarded against, and no matter how much time has elapsed, it must always be called into account when it is uncovered. Police have powers to govern the public, and can easily become habitual tools of oppression without even realising it. The Disaster was a blunder. It could easily have been avoided, but even so it was a blunder rather than corruption, and so can be forgiven after the debt to society is paid. The cover-up however was not a blunder, it was a premeditated crime, and those who orchestrated it must lose their rights to state monies and serve time in prison, for defamation and perverting the course of justice. As for the Category 6’s, there is no way that anyone can assume that setting the record straight will ever be enough on its own for those who lost family or friends at Hillsborough, and it is unreasonable to expect that it ever would. Not just the fact of the deaths, but the fact of the police’s lack of thought or care that led to them has to be answered for and penalised. If that doesn’t happen, British society would be saying that those who died were expendable, which would be to insult them in the grave, as well as setting an uneasy precedent for the rest of us at times when we have to depend on the police ourselves. Category 6’s also need to consider that the cover-up was the exact reason why so much time has passed. Therefore, arguing that it’s time to move on because it was so long ago is effectively to argue that the South Yorkshire Police should be rewarded for their deceitfulness. Category 7: The ‘I-Know-The-Fans-Were-To-Blame-Because-I-Know-Someone-Who-Worked-At-The-Stadium-And-He-Told-Me-So’ type. There’s an awful lot of overlap between this type and the ‘geo-loyal’ Sheffield people in Category 1. The impression they inadvertently give is that roughly a quarter of the people in the stadium on the day of the Hillsborough Disaster must have been stewards hired by Sheffield Wednesday Football Club. Many, many Category 7’s think they know everything that happened at Hillsborough, but cheerfully admit that they were not there themselves; they just ‘know someone who was’, usually a steward working for the club. Given how many Category 7’s I have encountered on internet sites down the years, I can only conclude (unless every single one of them happened to know the same, clearly very loud-mouthed, steward) that Sheffield Wednesday was remarkably over-staffed in 1989. To have so many staff on-hand to guard against overcrowding would of course make the Disaster even more inexcusable from the club’s viewpoint, but Category 7’s never seem to consider that. Category 7’s are yet another type that ardently insists, no matter what evidence you present to the contrary, that the fans were entirely and exclusively the cause of the Disaster. They are also another type that shows little conspicuous knowledge of what the course of events was on the day outwith the ‘bottleneck’ that formed in Leppings Lane. Perhaps more than any other Category, they have a delusory tendency to ‘telescope’ what little bits of information they do have on the subject into each other. For instance, they tend to know there were around two thousand fans still trying to get in when Gate C was opened, and they are aware of the rumour that large numbers of fans were ‘drunk and violent’. These two details are usually rolled into one by Category 7’s so that there were suddenly two thousand violent drunkards trying to force their way into the stadium. That there was no noticeable damage to the Leppings Lane turnstiles, gates, or concourse, that there was almost no damage to the perimeter walls (which is doubly-remarkable, given how dilapidated parts of them were discovered to be on later analysis), and that there were no fight injuries found on anyone who had been in the crowd of two thousand ‘violent drunkards’, are details that never invite comment or even consideration from Category 7’s. Clearly we must assume that it was just a very cautious and reserved crowd of two thousand ‘violent drunkards’. The stance of the Category 7 is therefore solely to give voice to a single, unsourced, uncheckable anecdote that does not match up to any other evidence at all, and to insist that the anecdote is definitive. It means Category 7’s add nothing of any value whatever to discussions of the Disaster, and as a rule, they can only support their position by invoking the stereotype of the ‘p*ssed-up Scouser’. This in itself hints at what their real motivations for interjecting in such discussions might be. Category 8: The ‘What-About-The-Money?! ?’ type, AKA The Hillsborough Time-And-Motion Student. This type of annoyance is to be found on most current affairs forums and the comments sections of most news websites, not just Hillsborough discussions, and it has to be said that wherever they comment, they seldom appear to be terribly interested in whatever subject is under examination, or know a great deal about it beyond the ‘bare bones’. The Category can be sub-divided into two types, but both are afflicted with the same cynical shortfall in moral curiosity. The first sub-group appears to be made up of just general Neo-liberal conservatives. Their sole motivation for interceding in any discussion at all appears to be one born purely of concerns about the greatest crime they can ever picture a Government being guilty of. But what is this crime? you ask. Bombing villages of innocent people off the face of the Middle East? No. Selling arms to corrupt Third World dictators to assist in the suppression of their own populations? Good grief, no. Declaring falsely-based wars in order to steal resources and so quench the Western World’s tortuous thirst for oil? No! Worse even than that! The Government activity that they object to most vehemently is this; the spending of… *GASP* …taxpayers’ money. Corruption, it seems, is only worth combating when it can be fought against cheaply. Police abuses of authority, and all the oppression that that entails, are a trivial matter when set against the big picture. (The big picture is dominated by the image of heroic Middle Englanders with sword in hand and shield on arm, bravely leaping from Ivory Tower to Ivory Tower of a vast bureaucratic Governmental machine, fighting off the evil soldiers of the state, all in a bid to secure the greatest boon of freedom that the democratic world can ever bestow upon its people i.e. a cut in taxes.) These people are almost exclusively from the Middle Class themselves, as is intimated by their tendency, on the rare occasions that they have any information to offer at all, to link to articles on the Daily Mail or Daily Express websites. They have no interest in football, which is a matter of personal taste and thus not a problem, but also no recognition of the reality that the Hillsborough Disaster is a long, long way from being an exclusively footballing matter. That most certainly is a problem. The other sub-group in this Category is more aggressive, and if anything, even more cynical. It is less that they are irritated by the expense of running inquiries into Hillsborough, more that they are unshakeably convinced of hidden motives that lie behind such inquiries. Quite simply, they are smugly certain that the Hillsborough Family Support Group, The Hillsborough Justice Campaign and Hope For Hillsborough are somehow all run by grasping, opportunistic charlatans who are taking shameful advantage of the deaths of loved ones in order to extort money from hard-working Middle Class British taxpayers. Essentially, this sub-group of Category 8 is obsessed with money, but feels a desperate need for the good of their own self-esteem to believe that everybody else has the same obsession, and so have to project such motives onto any person they witness with a grievance. In the case of the Hillsborough families of course, this accusation is not just shockingly cruel and insulting. It is also foolish, and shows a stunning ignorance of the decades of pain and frustration the Disaster’s bereaved and injured have gone through while battling the stony-hearted British legal machine. Many of the families have in fact been compelled to spend many thousands of pounds of their own personal funds, small fortunes that they will almost certainly never recoup, in pursuit of justice. In spite of being constantly let down by the judicial system, and meeting repeated unnecessary legal brick walls, still they have persevered. So let’s apply a little logic, shall we? When someone whose only interest is money finds that the route he is following over many years repeatedly costs him a small fortune, and never shows the slightest sign of yielding a positive return, would he persist with it for half a lifetime? Don’t be ridiculous. He would give up the chase long, long before twenty-four years have elapsed. If the Hillsborough families have not given up after that long a time, money cannot possibly be their motivation, and the fact that Category 8’s think otherwise only serves to prove that cynicism and realism are not the same thing at all. Category 8’s are a sad symptom of the idiotic right wing cynicism that has gripped a large core of the British chattering classes for the better part of forty years. Their intervention in Hillsborough discussions is another that offers nothing of value, as it will rarely contain any information about the Disaster itself. Category 9: The ‘It-Must-Have-Been-The-Fans’-Fault-Because-It-Didn’t-Happen-To-Anybody-Else’ type. A little like the views of Category 3’s, the central gist of the Category 9s’ position is an argument that most SYP-apologists will use at some point, but is again used in isolation often enough to merit being classed as a type all of its own. The argument Category 9’s offer is every bit as superficial as that offered by Category 3’s, but it actually manages to be even more flawed (which, if you’ll forgive the Bananarama reference, is really sayin’ something). The case being made by Category 9’s is that, because other FA Cup semi-finals were held at Hillsborough, featuring fans of other teams, and nobody died on those occasions, it follows that the deaths in 1989 must have been a result of fan misbehaviour. This argument fails on every level that it can be tested, and depends once more on stereotype and prejudice. The first test of it is to establish whether it is true that the Hillsborough Disaster never happened to anybody else. Well, I suppose if you go by nametags alone, then no, strictly speaking it didn’t. But more realistically – which is to say, by measure of whether the events are duplicated at other times – the claim is nonsense. It most certainly did happen at other times. For one example, in 1946 over thirty people were crushed to death in Bolton as a result of severe overcrowding on the terraces of Burnden Park during an FA Cup tie between Bolton Wanderers and Stoke City. If the Category 9 wishes the discussion to stay much closer to the bone of Hillsborough, that can be done while still easily proving him wrong; the Leppings Lane terrace had a considerable history of safety problems, including at other FA Cup semi-finals. In 1981, Tottenham Hotspur fans were caught in a major crush in pretty much the exact same place that saw Disaster eight years later. Nearly forty Spurs fans suffered injuries, including various broken bones, but death was thankfully averted when the police realised the danger and opened gates in the perimeter fence, allowing the endangered supporters to escape onto the field of play. This relieved the crowd pressure at the critical moment – exactly what the police lamentably failed to do eight years later. Further, crushing was also experienced by Leeds United fans in the central pens of the same terrace at the 1987 semi-final. Chillingly foreshadowing scenes of fans ailing on the terrace and having to be lifted up into the upper tier of the West Stand by other supporters above could be witnessed in 1987, albeit on a much smaller scale than would be seen two years later. 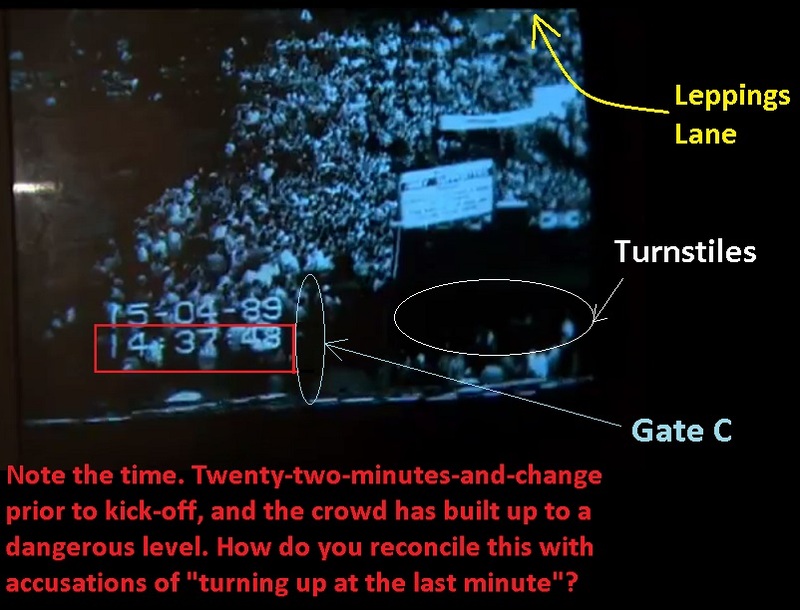 The second test is a kind of inversion of the first; was 1989 a completely isolated example of Liverpool fans being present at Hillsborough for an FA Cup semi-final? The answer is, no, most certainly not. Liverpool played Arsenal in the 1980 FA Cup semi-final at Hillsborough, and nothing serious happened in the crowd. Furthermore, Liverpool (with Nottingham Forest their opponents again) were at Hillsborough for an FA Cup semi-final just one year before the Disaster. Therefore, Liverpool fan behaviour at FA Cup semi-finals, even narrowly at Hillsborough, should not be examined purely on the basis of what happened in 1989. At the 1988 semi-final, Liverpool fans were again allocated the Leppings Lane terrace, and just like the Leeds United fans the year before that, they experienced substantial overcrowding and minor crushing. But critically, there were no deaths. 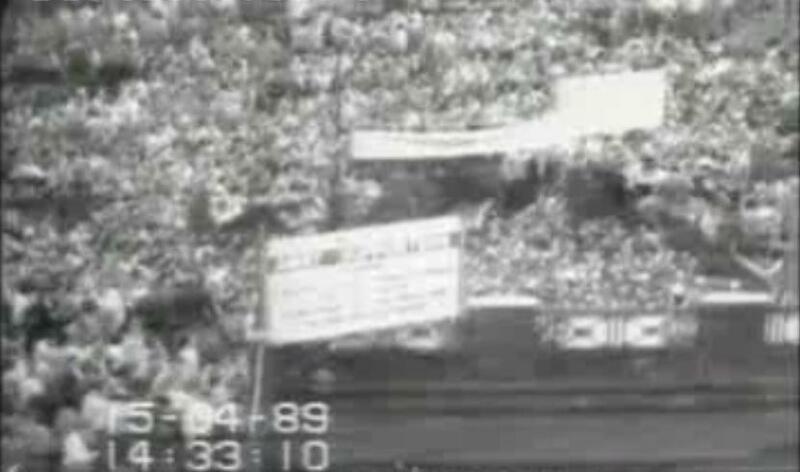 The situations and order of events in both 1987 and 1988 were in all important respects much the same, the only real distinction being that fans of different teams were present. The fact that Liverpool fans were present in 1988 and a Disaster no more accrued than it did when the Leeds fans were there a year earlier suggests there is nothing inherently wild or egregious about Liverpool fan behaviour, even at big occasion games. This suggestion is firmly underlined by the fact that between 1973 and 1992, Liverpool fans were present at Cup semi-finals and Cup Finals pretty much annually. Only at the Heysel Tragedy of 1985 and the Hillsborough Disaster of 1989 did particularly terrible things happen. To compare with 1981, for instance, the Spurs fans caught in that crush had two advantages over the Liverpool fans of 1989. Firstly, the Leppings Lane terrace back in 1981 had not as yet been divided into pens by radial fences, meaning that there was far more sideways movement available as a means of reducing crush pressure. Secondly, and far more importantly, the police attitude to the fans was quite different in 1981. On that occasion, they showed real alertness and enough concern for public well-being to open the gates in the perimeter fence and let people climb out of the terrace when they were in danger. In 1989, by contrast, the prevailing attitude was one of, “A well-behaved football fan is just a hooligan taking a day off”, and the desire to keep the fans contained meant that a lot of the police officers were too suspicious-minded, and too slow-witted, to twig on to what was happening. Some officers seemed almost to treat the cries for help from fans pinned against the front fences as a ruse to allow a pitch invasion. Another non-constant was overall police organisation. Policing efforts at the semi-finals in 1981, 1987, and 1988 were all handled by experienced Match Commanders e.g. Chief Superintendent Brian Mole, who knew enough about the peculiarities of the stadium, and of how to manage a very large crowd, to stave off outright Disaster (although there were still substantial failings even then). In 1989, the Match Commander appointed by South Yorkshire Police was Chief Superintendent David Duckenfield, who had only just been promoted around a month earlier, and had had almost no experience of policing a football game in over ten years. The South Yorkshire Police putting such an officer in charge of an occasion as huge as an FA Cup semi-final was complacent to the point of comatose. It meant that the policing effort on the day of the Disaster was effectively headless, as what leadership it had was more or less token. It is quite clear from the poor organisation and lack of police presence in Leppings Lane in the lead-up to kick-off, and from his general inertia when Disaster broke out, that Duckenfield was thoroughly clueless as to how to handle the situation. The Liverpool fans in 1989, therefore, were clearly in a substantially worse situation than the fans attending the previous semi-finals, and so their own behaviour does not need to have been any worse than that of their predecessors for the outcome of the day to have been so different. Category 9’s are probably the most vacuous type of all. Not only are they yet another Category that tries to discuss Hillsborough without knowing anything much about it, but their attempts to discuss it are effectively composed of talking in very vague general terms about other events altogether. On close examination, these other events are also ones that they know nothing about, as the declarations they make about them always turn out to be completely wrong. Category 10: The ‘I’m-A-Skeptic-Therefore-I’m-Too-Intelligent-To-Accept-What-Anyone-Or-Anything-Says-Including-The-Evidence’ type. This type is very similar in most respects to Category 4’s, not least in sharing the same warped idea of what constitutes rationality and skepticism. Now I am the first to acknowledge that the cardinal rule of being a healthy skeptic is that you don’t just believe something is true simply because someone tells you it’s true. (Category 5’s should please consider that when harping on about the Thatcher quote, by the way.) However, this does not mean that skepticism is the automatic gainsaying of what you perceive to be the majority view. Category 4’s and Category 10’s both seem to think it is. Rationality, meanwhile, requires that we doubt any assertion made without first receiving supporting evidence, or at least a logical deduction derived from less direct evidence. By contrast, Category 4’s and 10’s seem to think that rationality demands a rejection not only of assertions, but even of what the evidence itself points to. Hence, say you are discussing with them the question of whether ticketless fans played a role in the Hillsborough Disaster. If you should point to the Health & Safety Executive study, which concluded that the number of people on the Leppings Lane terrace was within the ticket allocation – the best evidence by far on the subject – both Categories will reject that as unreliable. They will probably justify this stance by saying, “The HSE might have got the count wrong. There could have been flaws in the technique they used to calculate it.” If you ask them to demonstrate what these flaws were, the answer will be something like, “Well I don’t know, do I? I wasn’t there when they did it. But they still might have got it wrong!” In spite of the fact that they are admitting that they know nothing about it, that they can’t demonstrate their own point, and that their position depends entirely on a speculative ‘maybe’ plucked from thin air – even while you direct them to the written evidence explaining the HSE’s counting techniques in full – both the Category 4 and the Category 10 will remain proudly certain that they are the ones who are being rational, and that you are the one making gullible, ill-informed judgements. Where Category 10’s deviate from Category 4’s is in their apparent motivation. The Category 4’s motivation is a kind of under-developed intellectual snobbery. They wish to remain stubbornly neutral on any topic of which they have no personal experience, simply priding themselves on their ability, entirely for its own sake, not to be convinced by anything they hear, no matter how well-supported the argument is. They feel that ‘not believing things is more intelligent than being credulous’. (Other people would call it an inability to make up their minds.) There is also the laziness aspect that checking an assertion requires making an effort to verify sources, which privately the Category 4 feels too lethargic to do. (On that note, I suppose my above use of the word ‘motivation’ is seriously open to question.) On the other hand, the Category 10’s motivation is not to remain neutral on the subject, but to keep SYP-apologia from dying a natural death. They are another type that has prejudice issues, usually of a traditional-footballing-rivalry nature, and want only to keep those prejudices intact, to the extent that they see evidence against their views as ‘biased’, ‘a coward’s weapon’, or even in some cases as ‘beside the point of the discussion’. I suppose Category 10’s have very slightly more to offer a Hillsborough discussion than some of the other types in that at least there’s a chance that they will let you present a few facts to them. But there is still very little chance of them assessing them in a fair or logical way, which is why I say they offer only slightly more. Category 11: The ‘You’re-always-complaining-about-that-disaster-but-we’re-the-real-victims!’ type. This is another type that has quite a bit of overlap with the ‘geo-loyal’ members of Category 1, but there are others besides. They aren’t necessarily among the more ignorant types, although they usually have one or two of the usual red herring accusations up their sleeves in the midst of an argument, but they do seem to be the Category that has the single most twisted sense of priority, and in a way that marks them as one of the most amoral, petulant and self-absorbed types. Now, Category 11’s don’t always deny blatant facts regarding what happened on the day of the Hillsborough Disaster, but they do seem to have a very odd beef over what followed, especially those ones who are supporters of Sheffield Wednesday. The term ‘persecution complex’ leaps to mind, but even that doesn’t quite hit the nail squarely on the head. Not all Category 11’s are Sheffield Wednesday fans of course. They include supporters at most other clubs around the country, and the reason for their sullen resentment seems even pettier and more skewed. A familiar chant often heard at games up and down the land is, “If it wasn’t for the Scousers we could stand…” implying that if the Liverpool supporters hadn’t been ‘so careless’ as to get shepherded into mortal danger in 1989, there would still be terraces at British stadia. (I wouldn’t bet on that, by the way. Hillsborough was a disaster that was bound to happen sooner or later – see Hillsborough: In Its Correct Historical Context – in which case even if the tragedy had been avoided on that particular day, the long-overdue debate about crowd safety in football would merely have been delayed.) While I understand why many fans prefer terraces to all-seater stadia, it does seem a little odd to take your frustrations out on victims of misfortune, especially when your own ‘misfortune’ happens to be that you get to watch football in a cleaner, more comfortable, and above all far safer environment than the grubby, decaying death-traps of the 1980’s. I suppose in a sense we can even include the ineffable Kelvin MacKenzie, editor of Britain’s most notorious tabloid at the time of the Disaster and writer of the most inflammatory headline ever written about it, in this Category as well, given his risible stance since the release of the Report of the Hillsborough Independent Panel that he is a ‘victim’ of the machinations of the South Yorkshire Police. Although in fairness to him – a gesture for which I see no motivation beyond the sheer mental exercise – he no longer seems to deny that the Liverpool supporters themselves were victims, at least not publicly. But for all Category 11’s… well, is there really any need to point it out? Because a) the club you support was barred from hosting a fixture, which it had no divine right to host anyway, for a couple of years, or b) you have to endure the ‘living hell’ of sitting down in comfortable seats in an environment that doesn’t smell suspiciously of urine and stale Bovril while watching a football match, or c) someone spread damaging lies to you about people you clearly already had a huge chip on your shoulder against to start with, if you therefore try and claim that you are the true victim of a disaster, you must be one of the biggest bloody cry-babies in the Northern Hemisphere. Ninety-six people were crushed to death at Hillsborough. Nearly seven hundred others were injured, many of them permanently, and some of them have been perpetually emotionally scarred by it. All of them and many others besides were then smeared and blamed for their own misfortune by the true perpetrators of the Disaster’s causes, all as part of the biggest cover-up in British legal history. And against all that, you have the curse of having to sit down at games, do you? Well, gosh. If you think you are in some kind of contest to be the biggest victim, let me promise you, I know who is winning. Category 12: The ‘You-pompous-civvies-never-know-what-it’s-like-for-the-police’ type. I could really just call this category The SYP apologists, which is the blanket term I coined a few years ago for people who insist on trying to shift blame for the Disaster from the South Yorkshire Police onto the Liverpool supporters. But that term was always meant for naysayers more broadly, and can arguably cover about five or six of the Categories detailed above. Category 12 is made up in large part of police officers themselves, while others are just ideological admirers of the police force in general. Their specific motivation for intervening against the Liverpool supporters in Hillsborough discussions is not football-related as such, but it remains tribal, only on a professional rather than leisurely level. They are more defensive than most other types, because they mistakenly see themselves as having a personal stake in the exoneration of the South Yorkshire Police for the Disaster (or at least, most of them are mistaken on this point, but a tiny minority are not). Excessive sympathy for fellow police officers, for no better reason than wearing the same colour uniforms – which in all important respects amounts to the same stupid tribalism of many football fans – is commonplace among policemen in Category 12. Partly, perhaps, it is just a ‘loyal’ desperation not to see someone from ‘their side’ getting into trouble, but also partly there is fear that were they to make similar mistakes and get into the same kind of situation when policing large crowds, the in-built excuse of the ‘disorderly masses’ stereotype would no longer afford their reputations any protection. This defensiveness leads to considerable circular reasoning and question-begging among this type. Inevitably, there is a frequent tendency to resort to all of the discredited (and often implausible) myths about widescale pushing-and-shoving, ticketlessness, late arrivals, and general hooligan behaviour among the Liverpool fans, but as usual, no attempt is ever made to establish whether any of this putative savagery truly occurred anywhere outside the imaginations of the South Yorkshire Police itself. (And those imaginations were very impressive. If you doubt that, I suggest you put ‘SYP000046060001‘ into Google and read the minutes of a police meeting in October 1989 to discuss the findings of the Taylor Inquiry – start reading from page 10. The mounting spiral of ever more histrionic anecdotes from a succession of police officers, each speaker seemingly trying to ‘trump’ the previous one with an even wilder and less plausible claim of witnessing violent behaviour, has more than an echo of ‘The Four Yorkshiremen sketch‘ from At Last The 1948 Show about it. Naturally, real evidence uncovered to support these allegations is practically non-existent.) In other words, it must all be true because the police said it was true, and the police said it was true because it is; the assertion becomes its own evidence, the epitome of circular reasoning. It goes without saying that some Category 12’s are, or were, members of the South Yorkshire Police themselves. They perhaps have more reason than the others to feel personally involved in this, but it doesn’t make their stance any more in keeping with reality. But again, this is another lazy, generalised assumption – to say nothing of once again accepting the premise of fan misbehaviour without firstly fact-checking it. Many, many police officers, including a significant number on the frontline of the South Yorkshire force who were themselves at Hillsborough were, and are, among the critics – many of their criticisms were among the details quietly deleted from their witness statements during the now-notorious vetting process. Geoffrey Dear, then-head of the West Midlands Police, may have been an ineffectual stuffed shirt when it came to addressing improprieties in the conduct of his own force, but he wholeheartedly concurred with Lord Justice Taylor’s damning verdict in the Taylor Interim Report that the cause of the Hillsborough Disaster was South Yorkshire Police failure. Saddening though it is to say it, I think Dear has to count as a police officer. Sometimes there is a grudging acknowledgement from the Category 12’s that there were mistakes made, but only in terms that imply that the errors were ‘forced’ by the pressure of ‘fan misbehaviour’. Given the decisive mistake was the failure to close access to the central pens when they were full, and that blunder was the failure of Chief Superintendent David Duckenfield, who was in the control room without any fans standing anywhere near him at the time, it is a view that can be treated with the same contempt in which it implicitly holds football supporters. Although there is no doubt that there is substantial dishonesty among Category 12’s – indeed they are probably the most dishonest type of the lot – the impression it is hard to escape from when arguing with them is that this dishonesty is only semi-conscious, more a case of reflexive denial than outright maliciousness. They seem to believe quite firmly that, even if what they are saying is not true physically, it is truthful ‘in spirit’, so to speak (“…they feel that their own version was what happened in the sight of God, and that one is justified in rearranging the records accordingly,” was the exasperated phrase George Orwell used when discussing similar types of ideologically-driven fraud). Self-idealisation by the police force becomes more important than establishing what the facts are, while stereotype becomes the substitute for real evidence, on the way to a premeditated exoneration of itself. Meanwhile, the desperation not to see themselves as incompetent or uncaring leads many police officers to exaggerate or lie wildly about what they witnessed. Soon they come to half-forget what they really saw, and to half-believe the fictitious version they invented. They not only cling to the myth of drunken fans more tightly than any other type, but the myth’s ultimate source – the police – is found among the Category 12’s number. And yet, given the other, unhinged accusations they aim at the Liverpool supporters, it is tempting to ask what the police themselves must have been drinking to come up with the ideas in the first place. Category 13: The ‘Any-attempt-you-make-to-exonerate-the-Liverpool-fans-means-you-must think-every-single-one-of-them-was-a-saint’ type, AKA The Hillsborough Worzel. In a sense, this isn’t a Category in its own right as such, as its occupants invariably overlap with other Categories, most particularly Categories 1-to-3. (1 and 3. 13. Geddit?) But those who use the gist of the Category 13 argument have probably the least honest attention-span of the lot, as their main tactic is reduced to refuting arguments that have never been made. Any SYP apologist is likely to fall into Category 13 at some point, but it will only happen some while after they first start arguing with someone who genuinely knows something about the Hillsborough Disaster. The gist of their argument will always be a classic symptom of stubborn resistance to plain facts – cognitive dissonance, in other words. The Category 13 position is a double-classic-fallacy, in that it is both a strawman argument and a false dilemma. In answer to the loaded question asked above, no, nobody is saying – or has ever said to the best of my knowledge – that the Liverpool supporters all behaved like ‘saints’ at Hillsborough. (The highly-debatable assumption implicit in the question is that all saints were, ipso facto, good people, which itself stands in contrast to considerable historical evidence, but we shall let that slide for now.) To suggest that exoneration of the fans for the Disaster implies perfect behaviour is the strawman argument. It is freely-acknowledged that there were isolated patches of bad behaviour, at least outside the ground, mainly during the crush at the turnstiles, when the stress and anxiety of the increasing crowd pressure caused tempers to fray. Whilst we are on that subject, I will say it now, as it is another loaded question I see asked with obtuse frequency on many, many Internet discussions by many of the same people; yes, had every single Liverpool supporter at Hillsborough behaved absolutely immaculately on the day, the Disaster would still have happened. The suggestion otherwise is based around the (false) belief that the fans were to blame for the exit gate having to be opened. Even if that were true – which it most certainly is not – it is a secondary matter, as the opening of the gate was not the decisive factor in causing the Disaster, as I have explained before. (It played a substantial role in increasing the death-toll, but not in creating the crush on the Leppings Lane terrace.) The decisive factor was the failure of the police and the club stewards to close access to the central pens when they were full. That was a mistake that the fans definitely did not play any role in, as it was not possible for them to do so – the decision was meant to be made by officers inside the police control box, who had no supporters anywhere particularly nearby to distract them. The false dilemma aspect of the argument is in the implication that there are only two possibilities; either the fans behaved perfectly and the Disaster would not have happened, or that the fans behaved unusually badly and therefore the Disaster had to be a result of that. It also hinges on the assumption that any and all bad behaviour that did occur must have played a role in causing the Disaster. Precisely how petty things like fans (supposedly) urinating in the front gardens of nearby houses could have had any effect on the course of the crush in the central pens is never explained – if it really happened then it was a very anti-social thing to do, but how would it make a crowd crush even a jot more likely? But then, the notion that the Disaster might have happened for reasons irrespective of the crowd behaviour altogether is not even presented as a point of consideration. This type does not so much have a debating position as a viewpoint that is arrived at via other Categories. It is a form of stubbornness, and can usually be taken as a sign that the Category 13 realises they are losing the argument and so are desperately trying to ‘hold ground’ by defeating arguments that have never actually been put to them. As with most strawman arguments created on any subject, this is because they quietly realise that there is no effective answer to what was really said. Category 14: The ‘Loss-of-police-control?-What-about-loss-of-self-control?’ type, AKA The Hillsborough Jedi Master. This is a rather narrow fringe type, and it’s one of those categories that don’t seem to have any particular beef or agenda in terms of football fandom, nor any particular stake in protecting the reputation of the police. They just seem to have a very tabloid-newspaper grasp on how certain civil processes work, and little comprehension of the terminology used to describe them. The Category 14 undoubtedly falls under the umbrella of the SYP apologists, in that, like Category 12’s, he feels that the South Yorkshire Police are victims of deeply unfair criticism that amounts to scapegoating. But the main basis of the Category 14 argument is a very limited understanding of what general role a police officer is supposed to fulfil in society. Now this is only a hypothesis, understand, but my suspicion is that this mentality originates with 1920’s silent comedy films. You know the sort I mean – cops ‘n’ robbers movies. On the black-and-white-and-fuzzy screen we see a massively overloaded police vehicle, with officers in every corner and on the roof and dangling off the back swinging truncheons and firing pistols in completely random directions. And the vehicle is struggling its way through the streets of Chicago in pursuit of another vehicle that is equally weighed-down with thieves, all of whom are dressed in black-and-white-hooped shirts, and have narrow strips covering their eyes, with little slits cut into them to see through. Just one of the many sillinesses that these sorts of movies perpetuate is the notion that policemen are the good guys who are there to catch the bad guys, and that they are nothing else whatever. The Category 14 therefore tends to get very worked up whenever they hear the (correct) conclusion of the Taylor Interim Report of August 1989, which was that the Hillsborough Disaster was caused by a failure of police control. The Category 14’s difficulty seems to be that the above cops ‘n’ robbers perspective dominates his outlook, and so it becomes a real task to picture any police activity that is not concerned with stopping ‘evil criminals’. A failure of police control therefore can only mean to them that the police were unable to force wrongdoers to behave themselves. Surely the prime culpability is with the evil wrongdoers though! And if the wrongdoers go so far as to blame the police, well, what hypocrites! It’s hardly the police’s fault that they couldn’t stop the robbers from behaving like that! The evildoers didn’t have to behave in such ways in the first place, did they? Telling off the police for failing to make them behave like civilised human beings? The cheek! What about the robbers’ own responsibility, eh? Where is their sense of self-control? They must learn control! They need to learn to stay calm, they must learn to control themselves etc! Some of this has faint echoes of Yoda’s speeches in The Empire Strikes Back, but it’s nowhere near as wise, because it’s the classic assumption made by a person who does not even realise that it is an assumption. The assumption in this case is that a loss of police control can only mean that there was violence that it was beyond their powers to quell. The failure in the Category 14’s viewpoint is that, in theory at least, the role of a policeman is more than just to blow a whistle and run around swinging truncheons every time a semi-masked thug marches out of a bank with a sack over his shoulder marked ‘SWAG’. The policeman’s role is not just to bash into line those who break the law, but to protect the public, and to maintain order. In other words, to provide guidance. Think back to one of the first pieces of advice we are taught in school. If you are out and about but get lost, the first thing you should do is find a policeman and ask him for directions. This should have been sage advice at Hillsborough, although it turned out not to be. We must keep in mind that most of the crowd would probably never have visited the stadium before in their lives, and would have needed guidance from the police and the club stewards just to find their way around. If the guidance given to the spectators by the police was inadequate to get them in and out of the ground smoothly and in good time, that would be enough to constitute a failure of police control. It would not require an inability to quell a riot. And sure enough, the reason Lord Justice Taylor concluded that there was a failure of police control was indeed that the guidance the police gave to the crowd at Hillsborough was very poor. Too many fans were assigned too few turnstiles at the Leppings Lane end of the stadium. There was a failure to organise arrivals into queues up the lane from the stadium, leading to chaos, confusion and pressure on the turnstiles. Many fans found themselves heading for the wrong turnstiles due to not receiving correct directions (in most cases, not receiving any directions). Not enough police officers were assigned to Leppings Lane to be able to give adequate guidance to well over twenty thousand people. And above all, the police failed to keep tabs on the crowd level within individual enclosures on the terraces inside the ground, or, most decisively of all, to close off access to any enclosures that were full. It is not reasonable at all to expect the crowd to take responsibility for any of that, as the great majority of them were visitors from other parts of the country and wouldn’t have known the lay-out of the ground. And it would be doubly unfair to expect the fans to have any idea which enclosures were full and which were not, as the walls of the stadium were blocking their view; it would not be possible for the fans to see the danger until they had arrived on the terrace itself. The police, who were supposed to be co-ordinated from the control box inside the stadium, had a full network of officers to relay important information to those outside. That they failed to relay the information was another example of a failure of police control. The police, in fact, deliberately relinquished control of the situation when it came to filling the pens, by adopting a policy of letting the fans ‘find their own level’ i.e. to let the fans with terrace tickets decide for themselves where to stand, and to let them move somewhere else if their chosen ‘spec’ became too uncomfortable – this is a policy that is fundamentally flawed on any standing area that is divided up by radial fences, as there will be almost no freedom of lateral movement available. Instead of only viewing a police officer as the strong arm of the Law – which alas is how far too many policemen seem to view the role themselves – we should really look at them to a certain extent as wider society’s version of an usher at a cinema or theatre. When you attend a theatre that you have never set foot in before, you will need guidance to find the correct door to reach the right auditorium, as well as the correct seat for your ticket. How do you do that? You ask an usher, just like when you’re out in the streets and have gotten lost, you ask a policeman for directions. By requiring that guidance, does that make you a criminal, or disorderly? Of course not. And in the same way, the crowd at Hillsborough were not behaving criminally or being disorderly by needing the police to give them directions for getting to the right entrance to go into the ground. The failure of the police to give them the correct guidance led to the problems that caused the fatal crush. Therefore, it was a failure of police control. Not a failure to control the behaviour of the crowd, but a failure simply to give adequate information, organisation and direction to the crowd. The Category 14 is another type that strongly invites the ‘useless contributor’ tag in discussions of Hillsborough. As a rule, they tend not to be very au fait with the Disaster’s events, nor terribly interested in it as a subject in itself. They usually just have a pedantic gripe about a single item of terminology that they only ever pick up on by vaguely overhearing it, and it’s a term that they don’t really understand the meaning of. Category 15: The ‘No-we’re-not-blaming-the-victims-we’re-blaming-the-hooligans!’ type. This type is a sort of variation of Category 2, in that it seems determined to split the blame for Hillsborough equally between Liverpool supporters and the police, but only does so by, perhaps unknowingly, invoking myths. What distinguishes the Category 15 from the Category 2 is a determination to sound more sympathetic. To this end, the Category 15 likes to be ‘nice’ to the victims by trying to emphasise that those who died or were injured are not the football supporters that they are criticising. Their criticisms are instead reserved for the fans who ‘arrived late’, to be allowed in through an exit gate, and who ‘pushed’ their way into the central pens of the Leppings Lane terrace, forcing the helpless victims at the front into the perimeter fence, crushing them. The problems with this argument are threefold. Firstly, the description of lateness, as has been explained ad infinitum both here and in other essays, is a red herring – the crush at the turnstiles began to form around twenty-five minutes before kick-off. Secondly, the ideas about pushing are also misleading at best, as again has been outlined elsewhere. But thirdly, and this is the crux of the problem with this halfhearted attempt to sound sympathetic, the argument draws a completely false distinction, and fails to recognise that, to varying degrees, pretty well everybody who was in the central pens that day was a victim. The false distinction is the idea that the fans who entered the stadium through Exit Gate C were the perpetrators, and the fans who had already entered the pens before the gate was opened were the victims. 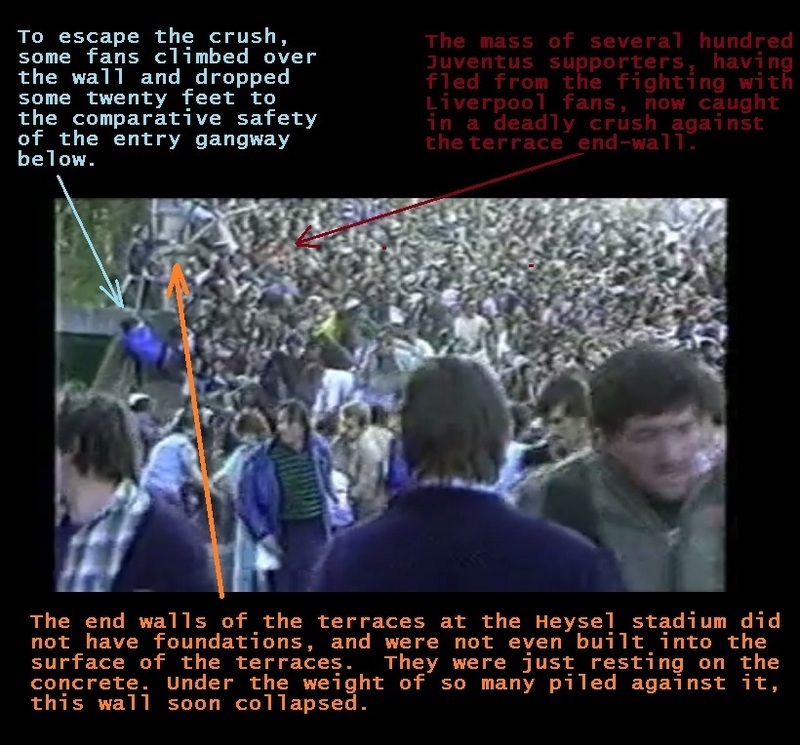 Even though the point was made as far back as 1996 in Jimmy McGovern’s docu-drama, it still seems to come as a shock to many people to learn that in fact, around a quarter of the people who died at Hillsborough did so having entered the stadium through Gate C. Not all the people who died did so trapped against the perimeter fence. Some died when a crush barrier collapsed and scores of people fell over in a lethal pile-up. Some died because they lost their footing and were inadvertently trampled on by those around them. Some died standing bolt upright in the middle of the pen, crushed by the weight of numbers around them – it is just as possible to be crushed by being surrounded by people as it is when surrounded by fences, after all. So long as what surrounds you are solid objects, you can be crushed. Even more though, some fans who entered through the exit gate did in fact end up right at the front of the pens within moments of arrival. Even a crowd as densely packed in as this one still had a lot of movement, especially those movements brought on by pressure-channels created by gaps between the crush barriers. Therefore there was no particular distinction between entrants through Gate C and those who died. Even if there had been, this does not necessarily preclude victimhood for those who went through the gate. A victim does not necessarily die, he or she is merely the subject of misfortune, and just about every fan to enter the pens that day was unfortunate to some degree. Even those who were not physically injured were traumatised by a frightening experience, and some of them saw other people’s crush injuries in graphic and hideous detail. The sights described in, for instance, Rogan Taylor’s book, The Day Of The Hillsborough Disaster, would surely live with those who witnessed them forever. Whether or not they were injured themselves, surely they are still victims for having to live forever with such memories? The most notorious, stubborn and persistent of the Category 15’s is probably Margaret Thatcher’s pig-headed former Press Secretary, Sir Bernard Ingham (who is now in his 80’s and therefore will, thankfully, probably not be around much longer. I’d just like to take this opportunity to wish him a brief and unhappy remainder of his retirement). He has made it very plain down the years that he will not retreat from the story he and Thatcher were told by the South Yorkshire Police when visiting the stadium the day after the crush, which was that a ‘tanked-up mob of five hundred’ fans, all without tickets (really? How did they find out?) forced their way onto the terrace, to crush their fellows at the front. No amount of evidence to the contrary – and that amount is huge – will persuade him otherwise, and in fact there is some doubt that he is even prepared to look at it, given how often it has been presented to him over the last quarter-of-a-century. Relatives of victims have sometimes written to him to protest his insensitive and false remarks, but the nearest he comes to backing down is to say, you guessed it, “I’m not blaming your loved one, I’m blaming the tanked-up mob.” Of course, he has never been able to cite any evidence at all that such a mob existed, bar the South Yorkshire Police’s own, very prejudiced, say-so. Any further attempt to convince him he is wrong is usually greeted with a demand to shut up. Without ever reading it, he even dismissed the Report of the Hillsborough Independent Panel, with its four hundred-and-fifty thousand pages of supporting evidence, as ‘propaganda’ that the current Government accepted for political reasons only. This is as shameless an example of the shoplifter calling the detective a thief as you could ever hope to see, especially in light of the South Yorkshire Police’s own very obvious motives for blaming the victims in the first place. ‘Sir’ Bernard Ingham pig-headedly tries to maintain, in flat contradiction of every scrap of evidence ever found about it, that the Liverpool supporters were to blame for the Hillsborough Disaster. This is foolish, because the trouble with blaming the victims of a Disaster for their own misfortune is that the same standards may be equally applied to the one dishing out the blame. Such as Tories and the Brighton Bombing, for example. If he ever sees it, I hope he finds it shocking and tasteless, because it may be the only way he will ever realise that it is doing to him and his fellows exactly what he has done to the victims and bereaved of Hillsborough for many years. Category 15’s in general are probably the most pompous type. Their stubbornness is not particularly remarkable for an ‘SYP apologist’ Category, but the assumption of superior morals, and of having a keener sense of responsibility than those who were involved in the Disaster – an assumption arrived at entirely on the basis of urban myths – makes it seem more insufferable. This in turn makes the pretense of sympathy for the victims – by drawing the false distinction from other fans – seem like a contemptibly feeble gesture. Category 16: The ‘I’ll-never-persuade-you-with-your-rational-analyses-critical-thinking-logical-deductions-and-mountains-of-well-researched-evidence-while-you’ll-never-persuade-me-with-my-stereotypes-stubbornness-and-desperation-not-to-let-you-have-the-last-word-so-let’s-just-agree-to-disagree’ type, AKA The Hillsborough Black Knight Who Always Triumphs. When I first watched Monty Python & The Holy Grail, I was well aware that it was a comedy, and therefore I was under the impression that the terribly amusing scene in which the Black Knight fights a losing duel with King Arthur was entirely contained within the bounds of comic fantasy. Since discovering the world of Internet debate however, and most particularly debates on football-related issues such as stadium disasters, it has dawned on me that, in reality, the Black Knight is quite plainly no mere figment of John Cleese’s imagination. Instead, he is an exact replica of opinionated news-groupies who simply have to have their say on any subject, no matter how little they really know about it. Tabloid readers lurking on YouTube sites, for instance, will always have a view on Hillsborough, and with very little prompting they will start a blazing row, in which it quickly becomes as plain as as a jumbo jet that they don’t know anything at all about what really happened, and are simply regurgitating myths that comfortingly conform to their prejudices against Liverpudlians, and even against football fans more widely. What is equally noticeable with these people is that they are every bit as unaware of how feebly they are doing as these arguments progress. Every single claim they ever make will be from those described in the Categories above, will be supported by precisely zero real evidence, and will be swiftly and effortlessly debunked. But the Category 16 will still seem very confident that they are, at the very least, highlighting ‘genuine doubts’ about the Disaster’s causes. The ‘doubts’ they raise to extenuate the guilt of the police are usually driven by the desire to see that “Scousers are always drunk, always short-tempered and always violent in all times and all places”. This desire to see the human race in stereotypes can be very seductive, as it makes the world far easier to understand for the intellectually lazy. In most respects, this Category is little different from a good five or six others listed above. It is their preposterous final retreat point that marks the Category 16 as uniquely deluded, and inadvertently very comical; when they run out of crocks to invoke, even though you will have defeated every single one of them, they will feebly, and very snottily, tell you that there is clearly not going to be any agreement on this – as though the only measure of how accurate information is is how many people agree with it (and that a sole dissenting voice among thousands is enough to establish a significant ‘division-of-opinion’) – and that therefore you should just agree to differ. Symbolically speaking, you have completely thrashed the Category 16, intellectually hacking off every single limb while they have failed so much as to graze one of your knuckles, and while twitching helplessly on the metaphorical floor at your feet, they are pathetically offering you a draw! I wouldn’t go so far as to say that you are not entitled to your opinion of course, but I would say it’s only really a phrase you should invoke on matters of personal taste rather than on matters of evidential fact. For example, saying, “I think this is a great movie” is subjective and therefore always a matter of opinion. Someone may disagree with you, but their reasons for disliking the film are unlikely to be any ‘more’ right or wrong than yours for liking it, they just have different preferences. Whereas saying, “I think all donkeys have seven legs” is no matter of opinion as it can be demonstrably proven wrong. Either way – and this is not something that the Category 16’s are alone in getting wrong – being entitled to your opinion does nothing to help establish what the facts are, and just because you are entitled to a view, that does not automatically make it as valid as the view of someone who has studied the subject in far more depth and detail than you have. You are probably not entitled to retain an opinion that has been shown to be at odds with the plain facts – at least not until you have presented measurably better facts in support of your view – and to retain it is in fact an exercise in telling lies. And you are certainly not entitled to have your opinions kept free of cross-examination or counter-argument. Freedom of speech extends to right-of-reply. Because in the end, that’s what almost all the Category 16’s are. Category 17: The ‘Stop-Talking-About-Hillsborough-Because-It-Happened-Ages-Ago-So-Let’s-Talk-About-A-Disaster-That-Happened-Four-Years-Before-That’ type, AKA The Hillsborough Pushmi-Pullyu. This Category, largely a splinter group from Category 3, appears to suffer from terminal confusion. Category 17 is another group of tribal football fans who are prone to ignorantly shouting, “Justice For The 39”, even while they are making it patently obvious that they don’t really care in the slightest about the Juventus fans who died in the Heysel Disaster. They just don’t like to see any public sympathy directed towards Merseyside, and hope that changing the subject from Hillsborough to Heysel will harden the hearts of the wider public. The main distinction from Category 3 is that Category 17’s are likely to work a bit harder on rationalising their attitudes. The result is that their arguments tend to be a little more sophisticated, but at the same time they contain a gaping flaw. Well, in fact, most Hillsborough campaigners do not, in my experience, have any great desire to talk about the 1989 Disaster. Some of them have a need to, perhaps, but only because of the denial of justice in the aftermath, and it certainly does not give them any pleasure talking about it. The reason discussion of Hillsborough continues, as I said in the Category 3 section above, is because matters relating to it were left unsettled by the legal industry cover-up that followed it. Had that not happened, then the matter would have been put to rest well over twenty years ago. So those of you who wish Hillsborough would just “go away” should blame the police for its longevity instead of the campaigners, who, I can assure you, wish it would “go away” as much as you do; it won’t until their grievances have been addressed. Um… Right, okay. So let’s get this straight, Category 17’s. You are saying that an event that happened about thirty years ago is less objectionable as a subject-of-conversation than one that happened about twenty-five years ago, because twenty-five years was too long ago, even though twenty-five years is less than thirty years, and so, er…. Sorry, you really have lost me. Now, speaking for myself, I am in fact perfectly willing to discuss Heysel with those who demand it of me, and I can assure you I am not the only Hillsborough campaigner who is prepared to. You can see my descriptions of Heysel on this very page, as well as on several others on this blog, so I am neither trying to hide anything nor trying to evade a subject. Of course, that evasion is actually being done by the Category 17, who is trying to veer away from discussion of Hillsborough by raising an objection that is contradicted by the very topic they are introducing to replace it with. It is fallacious and it is silly, and that is because it is grounded in spiteful resentment. Nine times out of ten, a mention of Heysel in response to a mention of Hillsborough is done out of maliciousness, not out of a desire to pay tribute to the dead. It is another example of ignorant emotions being allowed to guide the thought processes. And that is never healthy. If studying these Categories makes you think, “Blimey, talking about Hillsborough online must be tiring!” well yes it is. I’m not trying to put a soothing gloss on that. Is it worth the bother though? Well yes, I think it is. The realities of the Hillsborough Disaster have been so heavily distorted by the lies that were spread about it that a constant, strident effort to correct those lies is required. Even many people who think that they now know the truth are often prone to letting the mythical version of events colour their thinking without being completely aware of it. And equally, when considering Category 5’s, it is just as important not to let efforts to correct the picture then go to waste on attempts to build up an alternative fiction. Nothing could dishonour the cause of truth more greatly than using it as a springboard for vindictive lies. Not that I’m saying Margaret Thatcher is definitely innocent, but anyone who tells you that her guilt is a matter of historical certainty is lying to you, and probably to themselves. Some people fall into more than one of these Categories, and I would say the more Categories a person falls into, the less intelligent, reasonable or well-informed he or she is likely to be. Such hearts and minds are not worth much effort in most circumstances, but in the case of Hillsborough, any support that can be found for rehabilitating the truth will be needed. Ignorance and stubbornness, after all, are two of the greatest threats that the truth can ever face. They can destroy it. As it is, they have already left it bloodied, bruised and mutilated, for nearly a quarter of a century. Please note that this essay is occasionally added to as more patterns of behaviour come to my attention, so check back every so often to see if it has been updated. Also, if you have any additional categories to recommend that I might have missed, by all means leave a comment below for me to consider.